Everybody is looking for a better way to get things done these days. 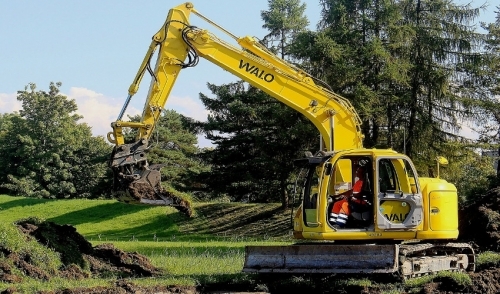 Contractors and homeowners just may find the answer in mini-excavators. These machines are so versatile you can do just about any type of construction work with them -- from using a hammer to break up concrete to digging holes for landscape work. These user-friendly, versatile machines are becoming an important development tool, particularly in urban areas where tighter quarters demand smaller, lighter equipment. With many bucket sizes and multiple attachment options, the mini-excavator is an extremely versatile tool. Attach a hydraulic hammer for demolition and pipe digging work. Dig out a curb or sidewalk without interrupting traffic at a busy intersection. Attach an earth auger followed by a thumb to load brush and sort recyclable material. Use for multiple backyard jobs, including digging up sewage pipes or electrical conduit. Break up concrete for demolition and recycling with a hammer attachment. Dig holes for landscape work -- buckets range from 12 to 24 inches. Work inside strip malls to break concrete, set up plumbing and finish the interior without interrupting other businesses. Rehabilitate old buildings -- light flotation makes them easy to get into elevators for multiple level demolition and remodeling. Coupled with a skid-steer, the two machines sometimes can be more economical than a bigger backhoe. Moreover, they can work on two different tasks at the same time. There are buckets for every type of digging and every type of dirt: For example, use a 24-inch bucket to dig footings; 12 and 18 inch for utility lines; and for soppy soil, use a 36-inch drainage bucket for the water and loose soil. Get into tight spaces -- some are small enough to fit through yard gates. Are so light they can cut red tape by eliminating the need for special highway-hauling permits and commercial driver’s licenses. Are set up to run like larger excavators -- almost anyone can get in and learn to operate a mini in a matter of minutes. Feature a quick-coupler attachment for quick exchange of any dipper-mounted attachment. Are much quieter than big machines when crossing over cement and hard surfaces. Feature ergonomic controls for easy operation. Have rubber tracks that don't slip while loading the machine for transport. Have rubber tracks that can move into narrow places with minimal damage to the ground, thanks to its light footprint. Are small enough to fit on pull-behind trailers and can be transported with pickup truck horsepower; some even fit in an extended pickup bed. Use a wide variety of attachments. Have a 360-degree swing arc that allows other units, such as a dump truck, to be placed wherever necessary -- the excavator can spin around to deposit the load where it needs to be. Dumping height usually is not a limiting factor.